"If it's the sea that separates us, I'll dry it with longing"
The Portuguese Final was held on March 7th at the RTP TV Studios in Lisbon, hosted by Júlio Isidro & Catarina Furtado. Before the final there were 2 semi-fiinals - click here for details: PORTUGUESE SEMI-FINALS 2015 The winner was chosen in two rounds of voting. In the first round 2 songs were chosen by televoting and 1 by a jury made up of the composers of the participating songs. 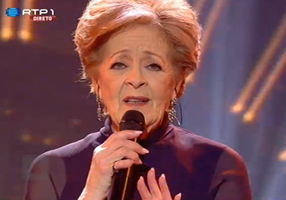 In the second round the winner was chosen by televoting. Leonor Andrade came 14th at the 2nd ESC Semi-Final. Simone de Oliveira represented Portugal in ESC 1965 & 1969.